The Greater Mankato Bike & Walk Advocates plan a week of biking and walking activities in Greater Mankato to celebrate Bike Month in Minnesota. Each night during bike week different biking and walking events are offered for the general public. There are other biking events celebrated during the whole month of May. The ride will depart at 10 am. 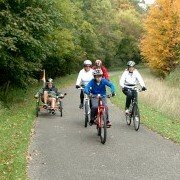 A 14 mile go slow group bicycle ride through lower North Mankato and lower Mankato, no steep hills, with frequent stops for brief history presentations. We will stop for lunch at the South Front Street restaurant of your choosing (lunch is not provided by the ride). This event is free and open to the public. 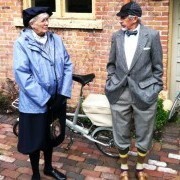 Helmets are required and tweed is recommended. The North Star Bicycle Festival, presented by North Memorial Health Care, is a multi-day, multi-location celebration of cycling. Riders will come through North Mankato. Held in seven locations across Minnesota and Western Wisconsin, the festival features a wide range of events, from the MN Fixed Gear Classic velodrome race to the Life Time Fitness Hillfest recreational ride to the North Star Grand Prix stage race to food trucks, bike expos and kids activities, including the Park Dental Tour de Kids presented by Shimano. To date, the MN Fixed Gear Classic and the North Star Grand Prix have attracted 2,500 of the country’s top professional and elite cyclists, including 32 Olympians. This year, hundreds of cyclists and thousands of fans are expected at the Festival, which will benefit Special Olympics Minnesota. Come for the races, stay for the fun. The Mankato River Ramble embraces the best of both bicycling worlds — off-road paved trails and quiet country roads. 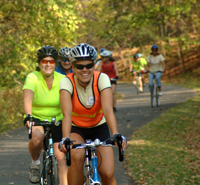 Riders can choose a scenic route of 16, 30, or 42 miles. The 16-mile Minneopa Falls Loop will visit the beautiful state park. The 30-mile “Pie Run” takes riders over the river and through the woods to reach the Rapidan Dam Rest Stop where you find an array of award winning pies. Riders seeking a greater challenge will love the 42-mile Lake Crystal Loop that visits the handsome towns of Rapidan, Lake Crystal and Judson.